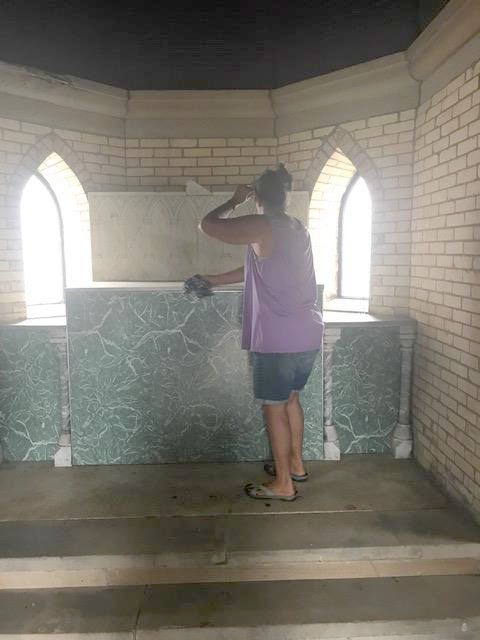 For nearly 20 years, Angela Yondo has unearthed neglected headstones in St. Andrew's Cemetery, rediscovering history and reconnecting the community to its roots. For nearly 20 years, Angela Yondo has unearthed neglected headstones in St. Andrew's Cemetery that for decades have lain hidden with overgrown weeds and grass. Her painstaking digging has not gone unnoticed. Yondo recently received the Grand Rapids Historical Society’s 2018 Albert Baxter Award for her efforts to resurrect and document 285 of the once-buried grave markers. She also has the records of another 200 whose gravestones she intends to track down at the unattended graveyard that has a history of neglect. There’s no single reason why Yondo uses her free time to resurrect and maintain grave markers since starting her project in the summer of 1999. One motive for working at St. Andrew's Cemetery is her enjoyment of the inherent solitude this graveyard in Southeast Grand Rapids makes possible. Another reason: when her children were younger, the gate around the cemetery, which was built in the 1970s to ward off vandalism, allowed them to roam freely without fear of running into a street. On a more personal level, Yondo, an administrative assistant for Holy Cross Cemetery, could not stand it that maintenance crews stopped mowing the lawn at St. Andrew Cemetery in the 1970s after responsibilities for the cemetery changed hands and upkeep fell to the wayside. Since that time, hundreds of the once stately headstones and obelisk markers have become overgrown with foliage or buried underneath the ground, while ivy has blanketed the two mausoleums’ exteriors. “The fence helps keep it safe, however if someone really wants to get it, they can easily get in," says Yondo. "The neighbors are very helpful and keep an eye on it." In addition to cleaning and maintenance, Yondo has worked to recover the history of these neglected graves. And her years of research have uncovered a head scratcher: women in Grand Rapids committed a rash of suicides in the late 1800s to early 1900s. According to “St. Andrew’s Cemetery in History" by Rev. John W. Magee, the cemetery was founded in 1853 through the work of Father DeCeunick, following a donation of a 10-acre plot of land by William Howard. Also, "Some of the earliest French-Canadian pioneers in this region are buried at St. Andrew's Cemetery. The graves of many other immigrants from Germany, the Netherlands and Ireland also can also be found here." Around 9,500 people have made the historic Catholic burial ground their final resting place, along with two granite mausoleums. Rev. Magee adds, "The cemetery holds the remains of many pioneers and philanthropists of our area: Louis Campau and family, John Clancy, the O’Brien family (first undertakers of the area), Theodore Kortlander, a 16 grave plot of the nuns of the order of the Little Sisters of the Poor, and many more." Through the years, Yondo’s husband and six children have helped with tracking down and unearthing the headstones. Yondo poured over scores of documents to help her find the tombstones including census records, cemetery deeds, sacramental records, and interment, church, and family letters. Father Dennis Morrow, who once served as the Grand Rapids Dioceses’ archivist, also helped Yondo secure funding for a ground penetrating radar device that helped her locate gravesites. People are no longer buried at St. Andrew Cemetery, but Yondo wishes it would be a working graveyard again. She considers her work there is a personal legacy. “The work that I do there is probably only important to me and my family, to be honest," says Yondo. "It is where my family will be laid to rest, and I feel a great connection to the cemetery, and I enjoy the company and friendships of the neighbors." Photos courtesy of Angela Yondo.